Websites, journals, videos, and books featuring information on Early Christian Texts. Have an idea? Use the form below to share your suggestions. Don’t miss the frequently asked questions page, where you’ll find answers to some common questions. Promotes the academic study of religion and creates opportunities for research, dialogue, and engagement for religious studies scholars. Early Christian art illuminates patterns in the ancient data that don’t match our modern imagination of the past. Includes art and cutting-edge research focusing on the authority of early Christian women. Opening the Scriptures for your Spiritual Journey. A community faithful to Christ’s example, pursuing social justice and offering radical welcome to all. This site is dedicated to extracanonical Gospels — early Christian Gospels which weren’t included in the New Testament — and includes several public domain translations. 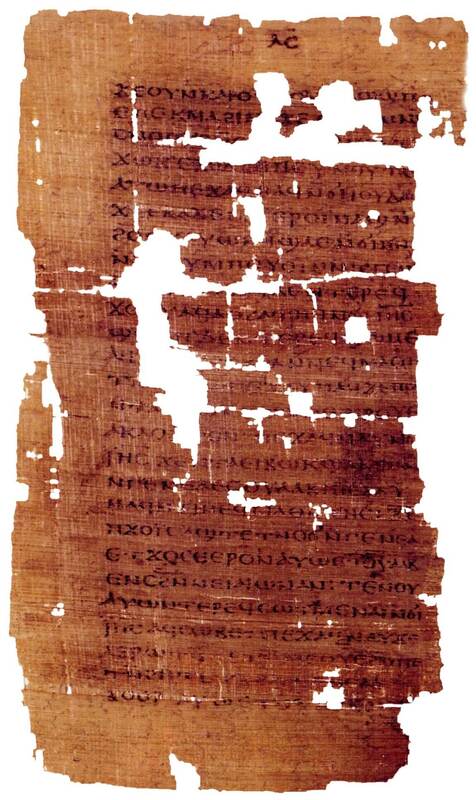 Fragment of the Gospel of Judas, public domain image (Wolfgang Rieger) from Wikimedia Commons. Helping individuals and faith communities expand their divine images, deepening their spiritual experience and contributing to justice and peace. A scholarly organization dedicated to the study of the history, literature, and theology of ancient Christianity. Dedicated study of the Christian Apocrypha, a vast assortment of texts that feature tales of Jesus, his family and his immediate followers but, or various reasons, are not included in the New Testament. An ecumenical, radical, Christian movement. This site emphasizes creative and relevant ways of understanding Womanist, Feminist, Mujerista, and Asian Feminist theologies. Oldest and largest learned society devoted to the critical investigation of the Bible from a variety of academic disciplines. Dedicated to exploration of the many discoveries of texts from the earliest Christ movements. Many of these texts are in Coptic, and ‘tanho’ is the Coptic word for ‘make alive’ — which is the hope of the Tanho Center. Dedicated to fostering and communicating the results of cutting-edge scholarship on the history and evolution of the Christian tradition, raising level of public discourse. The official journal of the American Academy of Religion. Publishes research that covers the full range of world religious traditions together with provocative studies of the methodologies by which these traditions are explored. Each issue also contains a large and valuable book review section. The flagship journal of the field, it is published quarterly and includes scholarly articles and critical notes from a variety of academic disciplines by members of the Society of Biblical Literature. Focuses on the study of Christianity in the context of late ancient societies and religions from C.E. 100-700. Every issue features an extensive book review section. It is the official publication of the North American Patristics Society (NAPS). To the left, Deborah Saxon, PhD, presents “Journey Through Forgotten Scriptures,” an exploration of newly-discovered writings by early followers of Jesus. This short film that examines extra-canonical texts is the product of a very thoughtful film-maker, Rev. John Rogers, in collaboration with Hal Taussig, PhD, and animation by Elizabeth Honer. A version of this video is also available on the website of the Tanho Institute.The word “tanho” is from the Coptic—the only language that many manuscripts of extra-canonical texts now exist in—and it means, “to become alive again.” Tanho’s mission is to help them “become alive again” in the 21st century. This video is a short introduction to Shirley Paulson’s online learning course, “Ancient Christian Texts for Modern Healing,” and online course available on Udemy. Information about each book can be obtained by clicking on the title. Scroll down to read the information listed alpha by author. Barnstone, Willis and Marvin Meyer, ed. The Gnostic Bible. Revised ed. Boston and London: Shambhala Publications, 2009. Meyer explains in the Introduction the key issues in the current scholarly debates about the identification and categorizing of so-called gnostic texts. The term ‘bible’ in the title refers to the generic Greek biblia (books), so this volume encompasses a wide range of books related to the main theme – from the earliest Wisdom gospels to Islamic and Cathar literature. It includes the texts found at Nag Hammadi, Egypt. Brakke, David. The Gnostics: Myth, Ritual, and Diversity in Early Christianity. Cambridge, MA: Harvard University Press, 2010. Brakke argues that the Gnostic school of thought originated as a Christian movement. His goal is to make space for this particular voice within Christianity to be heard and spoken again today. Methodologically, he treats historic reasons for heretical notions, showing where they originated and where they distorted concepts of Gnostic teachings and ethos. Then he shows the historic development of “Gnostic” thought from Sethianism through Valentinianism, indicating both the falsities that have been handed down from polemic writers and the truer meaning of the gnostic teachings. He demonstrates the anachronistic impossibility of the church rejecting Gnosticism, but also how the gnostic school of thought actually played an important role in the process by which Christians continually reinvent themselves. Brock, Ann. Mary Magdalene, The First Apostle: The Struggle for Authority. Cambridge, MA: Harvard University Press, 2003. The four New Testament gospels and other extra-canonical texts tell the story of the life, death, and resurrection of Jesus from different perspectives. By examining concrete details such as who is the first to see the risen Jesus and who receives a direct commission from Jesus to go and share the good news (both crucial to whether someone was considered an apostle), Brock clearly demonstrates the conflicts and struggles among the various groups of early Jesus followers regarding apostolic authority and makes a compelling case for Mary as the first apostle. De Boer, Esther A. The Gospel of Mary: Listening to the Beloved Disciple. De Boer describes the differences in the portrayal of Mary in five texts, the Gospel of Mary and the four New Testament gospels. Particularly insightful is her description of the way in which the Gospel of Mary utilizes and innovates upon Stoic concepts and served as “a testimony of creative mission” for the time and place in which it was written. She does not think it should necessarily be read as a Gnostic text but rather as a book that can be interpreted best within the broader context of Jewish, Christian, and Stoic perspectives. DeConick, April D. The Gnostic New Age: How a Countercultural Spirituality Revolutionized Religion from Antiquity to Today. New York: Columbia University Press, 2016. DeConick’s semi-popular style appeals to a larger, non-specialist audience who may be unaware of the scope of extracanonical writers and the relevance of their work. DeConick’s illustrations connect with modern film and embody the ideas she finds in the ancient writings. But critics argue that she glosses over nuances of the issues and could be misleading for those seeking greater depth in the texts. Dewey, Arthur J. Inventing the Passion: How the Death of Jesus Was Remembered. Salem, OR: Polebridge Press, 2017. Understanding the events around the death of Jesus is more difficult than one might imagine, because there is so little historical evidence for it. Despite the images of Jesus as healer and teacher, there are no images of the death of Jesus from the first four centuries. Dewey investigates the stories that began to emerge in the second century, what the silencing role of crucifixion meant, and why the stories were important to the evolution of Christian thinking. Dunderberg, Ismo. Beyond Gnosticism: Myth, Lifestyle, and Society in the School of Valentinus. New York: Columbia University Press, 2008. Dunderberg’s analysis of the Valentinian subcategory of so-called gnostic texts demonstrates why he thinks of these texts as evidence that there were Christians with an advanced spirituality. Rather than searching for boundaries between the two groups, he conceives the Valentinian community as a group within the ‘ordinary’ church. Their myths constructed a kind of picture of this world and humankind in order to change the way the world is perceived. Unlike the general attitude that the general gnostic theological premise was alienated in the universe, he sees their worldview answers to the problems of theology as much less existentialist than had been expected. It is no wonder that Dunderberg is ready to say, “I bid farewell to the discourse of orthodoxy and heresy, which can be seen in the ways scholars have used the term ‘Gnosticism’” (14). Funk, Robert, et al. The Five Gospels. This new translation of the gospels includes the Gospel of Thomas, the most famous of the discoveries at Nag Hammadi, Egypt and allows the readers to compare all five easily. It also includes the findings of Westar’s 25-year-long Jesus Seminar. Kateusz, Ally. Mary and Early Christian Women: Hidden Leadership. Cham, Switzerland: Palgrave Macmillan, 2019. Kateusz’s research on the leadership of women in early Christianity was “for little girls” who should not be told to “be submissive, like the Virgin.” It was a lie repeated through Christian authorities that caused untold suffering. Her research relies heavily on figures of art, as well as textual collaboration, showing repeatedly the evidence of women leadership in the earliest Christian practices and the subsequent efforts to hide it. King, Karen L. The Gospel of Mary of Magdala: Jesus and the First Woman Apostle. Santa Rosa, CA: Polebridge Press, 2003. The three parts of this book include the full text of the brief gospel itself and King’s own English translation, her interpretation of the gospel’s teaching, and her assessment of its significance in the development of early Christianity. King’s valuation of this ancient document is highly important in that she argues its appearance causes the “old master story of the history of early Christianity” to be challenged and rewritten (39). While she explains its distinction from clichéd categories of ‘gnosticism,’ as well as its radical departure from the elite teachings of Plato and the Stoics, King also claims the text offers a new vision of the ancient Christian community. It modeled authority based not on a succession of past witnesses, but on understanding. She argues that Mary’s teaching and example validate women’s leadership in antiquity when it was “based on unwavering faith, spiritual understanding, moral strength, and a commitment to further the gospel and help others” (187). King, Karen L. The Secret Revelation of John. As King points out, the Secret Revelation of John (or, ‘Secret Book of John’ or ‘Apocryphon of John’) must have been one of the most important and widespread texts produced in the second century CE. It is unique as the first Christian writing to formulate a full narrative of the nature of God, the origin of the world, and human salvation. King’s monograph is also of great importance now because no other monograph has covered the depth and breadth of the text as this one. She writes for the nontechnical person but provides valuable scholarly references in footnotes. The book includes a full translation of both the longer and shorter versions of the text, along with explanations of its origins, its religious and philosophical contexts, and King’s interpretation. King, Karen L. What is Gnosticism? Cambridge, MA: The Belknap Press of Harvard University Press, 2003. King answers her question, “what is Gnosticism?” in the scholarly context of the history of Christian thought. It begins with an analysis of heresy and meaning in the process of Christian evolution. A large portion of the book is devoted to the history of the teaching on Gnosticism as a Christian heresy. The content of these texts caused significant reconsideration of the categorization of Gnosticism, reversing the polemic arguments. King conjectures that the term ‘Gnosticism’ may disappear from scholarly categorization. But whether it remains or not, she argues that what is important is to recognize and correct the ways in which the discourses of orthodoxy and heresy have distorted our reading and reconstruction of ancient religion. The challenge now is to propose a new framework for the study of religion in antiquity. Layton, Bentley. The Gnostic Scriptures: Ancient Wisdom for the New Age. Edited by David Noel Freedman, The Anchor Bible Reference Library. New York: Doubleday, 1987. This work is Layton’s own translation of his selection of texts. His aim was to avoid theological jargon and to translate all important terms in a similar way, enabling readers to compare the wording of one work with another. The compilation includes some material not found in the other sources above such as fragments from second-century Christian thinkers such as Valentinus and Basilides and some Hermetic excerpts. But it does not include all Nag Hammadi texts. Lewis, Nicola Denzey. Introduction to “Gnosticism:” Ancient Voices, Christian Worlds. Oxford, New York: Oxford University Press, 2013. This book is prepared for students and people seeking to understand better what they’ve heard about gnosticism. Diving straight into these texts without a guide is perplexing and disorienting, and Lewis addresses the complexity with clarity and enough depth to give the reader a good foundation for further study and contemplation. She covers the historic problems with the study of gnosticism, the history of the texts, their cultural setting, and the overall meaning of the most important ones. 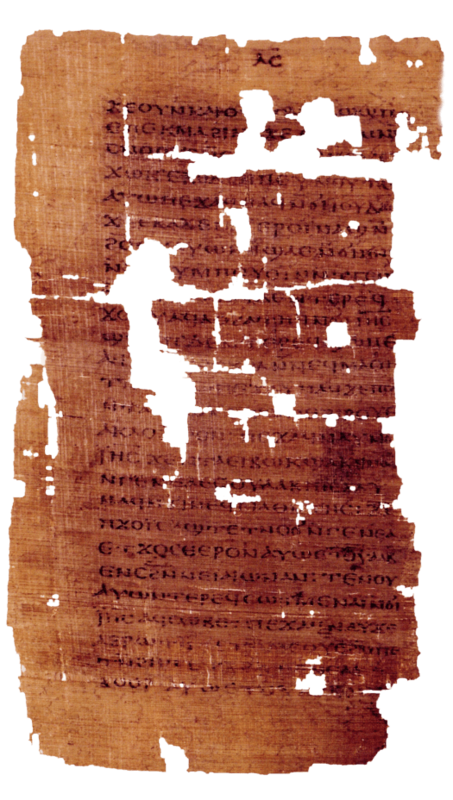 Most of the work concerns the texts found in the Nag Hammadi Library (which she explains), but she also discusses the Gospel of Judas and the Gospel of Mary. Meyer, Marvin, ed. The Nag Hammadi Scriptures: The Revised and Updated Translation of Sacred Gnostic Texts. The International Edition ed. New York: HarperCollins, 2007. This collection of texts includes all of the Nag Hammadi codices and two other highly important ones: the Gospel of Mary and the Gospel of Judas. This work seeks to take advantage of the recent generation of scholarship represented by James M. Robinson from an American team, Wolf-Peter Funk from a German team, and Paul-Hubert Poirier from a French-Canadian team. Miller, Robert J. Helping Jesus Fulfill Prophecy. Miller explains why scholarship cannot harmonize the New Testament fulfillment of prophecy with historical evidence. Believers in the past and present have looked for proof of divine fulfillment because they believe it is true. But in doing so, argues Miller, they have created or interpreted prophecies that never existed. The purpose of the work is not to discredit belief but to help believers (and non-believers) recognize the purpose of such prophetic interpretation and distinguish history from fantasy. This was the book that made the public aware of the amazing new discoveries at Nag Hammadi. Scholars had long-assumed there were lost ‘Gnostic’ gospels, so when texts at Nag Hammadi and elsewhere came to light, Pagels published a book about them for a broader audience. This was just one year after a one-volume translation of the Nag Hammadi Library appeared in English. Pagels now questions the very term “Gnosticism.” (See Williams’ and King’s books for the reasons why.) However, her book was crucial to helping both scholars and the larger public understand that the diversity among early groups of Jesus followers could not be construed merely (or even primarily) in terms of doctrinal differences but involved broader social and political issues. Dissertation. University of Birmingham, UK, 2017. This PhD thesis consists of a critical ‘conversation’ about healing theologies and practices between historical texts and Paulson’s own contemporary Christian Science experience. The historical texts are the second-century Secret Revelation of John and the nineteenth-century Science and Health with Key to the Scriptures, by Mary Baker Eddy. The conversation is structured on three key themes, or enduring theological ideas, which form the basis of similar Christian healing practices among our three historic periods. Robinson, James M., ed. The Coptic Gnostic Library: A Complete Edition of Nag Hammadi Codices. Five vols. Leiden: Publisher: Brill. Leiden, 2000. This is the complete version of the Nag Hammadi Library in five volumes. It includes both the Coptic and the English translation as well as commentary and notes. A shorter version was published in one volume in English only by James Robinson and his team of translators and editors in 1978. The one-volume edition was updated by Marvin Meyer in 2007. Robinson, James M., ed. The Nag Hammadi Library: The Definitive Translation of the Gnostic Scriptures Complete in One Volume. Third ed. San Francisco: HarperSanFrancisco, 1990. This is a seminal work for anyone interested in reading what some early followers of Jesus actually wrote, listened to, or read in the first three centuries after the life of Jesus. This book contains the first translations of these texts into English. 40 of the 52 texts, including the well-known Gospel of Thomas, existed in no extant form until these texts surfaced in 1947. The book also includes other important finds from other sites such as The Gospel of Mary and the The Act of Peter. Saxon, Deborah Niederer. The Care of the Self in Early Christian Texts. The Bible and Cultural Studies. Gewerbestrasse, Switzerland: Palgrave Macmillan, 2017. This book presents the first three centuries after the life of Jesus through the lens of Foucault’s “care of the self.” It reveals a rich variation among early Christ movements by illuminating their practices instead of what we anachronistically assume to have been their beliefs. Analysis of the discourse of martyrdom demonstrates how Clement, Ignatius, and Polycarp represented martyrdom as self-care. The book then brings to light an entire spectrum of alternative views in texts from Nag Hammadi and elsewhere. Its analysis exposes the false binary of thinking in terms of “orthodoxy” versus “heresy” or the specific heresy of “Gnosticism.” The analysis has many implications for feminist scholarship. Taussig, Hal. A New New Testament: A Bible for the Twenty-First Century. Boston, New York: Houghton Mifflin Harcourt, 2013. In addition to 10 of the newly discovered texts, along with the entire New Testament, the introduction to this book includes valuable insights regarding the sources of extracanonical texts and their relationship to the traditionally defined canon. The last portion of the book is an excellent ‘companion’ to A New New Testament, including explanations of its context in antiquity and today. Finally, its suggestions for individual and group study are most useful. Williams, Michael Allen. Rethinking “Gnosticism:” An Argument for Dismantling a Dubious Category. Princeton, NJ: Princeton University Press, 1996. Williams is an early voice in the scholarly questioning of the categorization of ‘gnosticism’. As a category constructed in our time, he argues, it survives more as an obstacle to understanding. The book begins with an outline of the main teachings of what ‘gnosticism’ was and the allegations against it. The second half of the book deconstructs the gnostic clichés, showing why a typological designation would be preferable. Williams suggests replacing ‘gnosticism with ‘biblical demiurgical myth,’ because it is a more accurate description; and it includes the distinction between creator(s) and controller(s) of the material world and the transcendent divine being of Christian scripture. Share your resource suggestions using the form below. For longer comments or suggestions, please use the contact form here.